If those negotiations lead to specific policies that produce a stabilization and then downward trend in the ratio of federal debt to GDP over the medium term, the rating will likely be affirmed and the outlook returned to stable, says Moody’s. If those negotiations fail to produce such policies, however, Moody’s would expect to lower the rating, probably to Aa1. 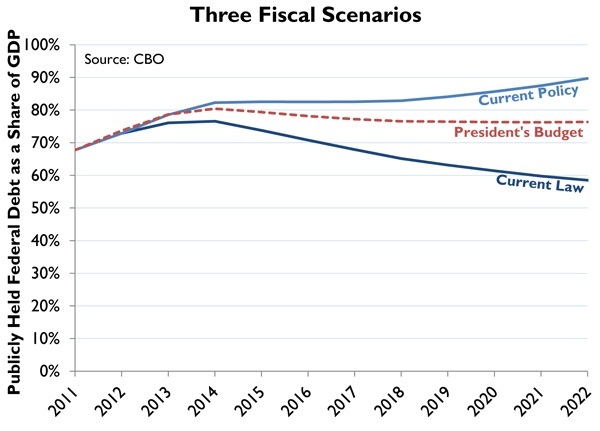 The following chart gives some idea of the likelihood of a downgrade based on CBO projections of three policy scenarios. Current policy, which would extend the Bush tax cuts, the Alternative Minimum Tax, and other provisions, most obviously would not meet Moody’s standard of a downward trend in debt-to-GDP. Publicly held debt-to-GDP would climb from 73 percent this year to 90 percent in 10 years. Current law would allow the Bush tax cuts and other provisions to expire at the end of the year, resulting in the fiscal cliff/taxmageddon nightmare scenario that most economists figure would plunge the U.S. into another recession. Moody’s seems to be more sanguine about this option, as the CBO predicts it would stabilize the debt at 76 percent of GDP in 2014 and then steadily reduce the debt to 58 percent of GDP by 2022. The President’s Budget is somewhere in between, though closer to the current policy scenario in terms of debt reduction. It would stabilize the debt at 80 percent of GDP in 2014 and then lower it to 76 percent of GDP by 2022. It would actually slightly increase in 2022, from 76.26 percent in 2021 to 76.33 percent in 2022. This is also an increase over the current year, so it appears the President’s Budget would lead to a downgrade based on Moody’s standard. Feeding into this is CBO’s prediction of the economy, which indicates the President’s Budget would result in less economic growth in the long run than the fiscal cliff/taxmageddon scenario. In other words, the President’s Budget both fails to grow the economy and fails to rein in the debt.